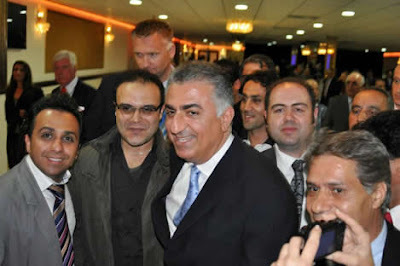 Persian Dutch Network – “If tomorrow our country is attacked, it just destroys our chances for democracy”, Reza Pahlavi, Crown Prince of [Iran] said in a press conference in The Hague. The Prince is paying a short but intense visit to The Netherlands in order to present evidence to the International Criminal Court in order to charge the supreme leader of Iran for crimes against humanity. “As the Iranian government has not signed the Rome Statute we cannot send a complaint to the court as citizens or groups”, Reza Pahlavi told the Persian Dutch Network in a video interview. “Everything is up to the Security Council of the United Nations to refer the file to the ICC,” he added. 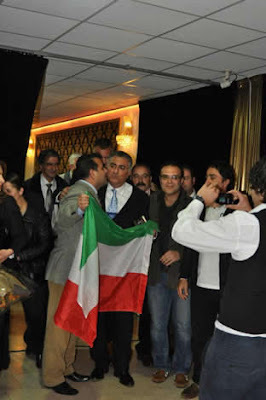 Prince Reza sought support from those who care about human rights issues in Iran. Crown Prince Reza was welcomed in The Hague by his supporters. Prince Reza Pahlavi is meeting with Dutch Parliament members. Dutch media has warmly received his arrival to The Netherlands. The Iranian Embassy in The Hague has not yet reacted to the Prince’s trip. Before the Crown Prince went to The Hague, he had been in Berlin. Members of the federal parliament (Bundestag) had agreed to meet him and to discuss his concerns. However, the meeting was cancelled at short notice. But Crown Prince Reza could talk to media people in the German capital, among other to the B.Z. News aus Berlin and an Iranian TV station (see below). Why the German politicians shied awayfrom a meeting with Crown Prince Reza is at everybody's guess. Here is a video of the opening statement of Prince Reza Pahlavi at the occasion. Crown Prince Reza has an exceptional sense of timing. The fascist regime in Tehran is of course supporting Syria's mowing down of its own people, just as they mow down their own. If Assad falls, so will Hamas and Hezbollah, and the revolutionary contagion will spread to Iran, but Iranians are plenty fed up with the regime anyway. In recent times the animosity among the opposition in exile and underground dating to the Revolution and previous eras has lessened because of a need to work together. I hope so. A united front is necessary to overthrow this regime, but they must also deal with the Green Movement which on one hand comprises people who are part and parcel of the IRI system, and on the other hand has sympathisers of banned movements. in the original source it's "crown prince of Persia" but you have changed that to "crown prince of Iran" ! True, but that was the title, with which he left Iran in 1978. On 27th July 1980 he swore the oath as new Shahinshah. So, he could be called both: Crown Prince of Iran or Shahinshah of Iran. Persia might be the old name for the country, but the Pahlavi dynasty refers to this ancient and noble country as Iran. when you quote you need to "quote", not adding your personal ideas. In Persian Dutch Network's first paragraph it's Persia.